Will May 20th Go Down In History As the Day the U.S. “Petrodollar” Monopoly Was Finally Shattered? …The struggle over Ukraine has caused Russia to completely re-evaluate the financial relationship that it has with the United States. If it starts trading a lot of oil and natural gas for currencies other than the U.S. dollar, that will be a massive blow for the petrodollar, and it could end up dramatically – and negatively – impacting the average American’s current standard of living. Let me explain. 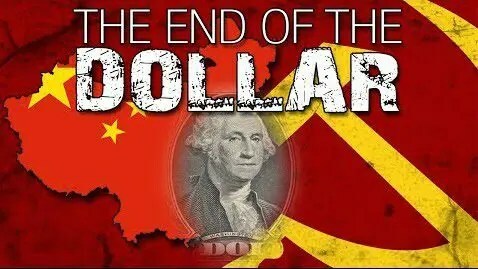 The above are edited excerpts from an article* by Michael Snyder (theeconomiccollapseblog.com) entitled De-Dollarization: Russia Is On The Verge Of Dealing A Massive Blow To The Petrodollar. The following article is presented by Lorimer Wilson, editor of www.munKNEE.com (Your Key to Making Money! ), www.FinancialArticleSummariesToday.com (A site for sore eyes and inquisitive minds) and the FREE Market Intelligence Report newsletter (register here; sample here) and has been edited, abridged and/or reformatted (some sub-titles and bold/italics emphases) for the sake of clarity and brevity to ensure a fast and easy read. This paragraph must be included in any article re-posting to avoid copyright infringement. For decades, virtually all oil and natural gas around the world has been bought and sold for U.S. dollars. As I will explain below, this has been a massive advantage for the U.S. economy. In recent years, there have been rumblings by nations such as Russia and China about the need to change to a new system, but nobody has really had a big reason to upset the status quo. However, that has now changed with the struggle over Ukraine. According to Russian news reports the country’s Ministry of Finance is getting ready to pull the trigger on a “de-dollarization” plan…to radically increase the role of the Russian ruble in export operations while reducing the share of dollar-denominated transactions…On April 24th, in response to American sanctions against Russia, the government organized a special meeting of top level experts from the energy sector, banks and governmental agencies, and chaired by First Deputy Prime Minister of the Russian Federation Igor Shuvalov, to find a solution for getting rid of the U.S. dollar in Russian export operations. If Russia does, in fact, go through with this de-dollarization plan it wouldn’t just be a slap in the face, it would essentially be like slamming an economic fist into our nose. [Why? Because]…Russia is not just a small player when it comes to trading oil and natural gas. The truth is that Russia is the largest exporter of natural gas and the second largest exporter of oil in the world and if Russia starts asking for payment in currencies other than the U.S. dollar, that will essentially end the monopoly of the petrodollar. In order to do this, Russia will need trading partners willing to go along with their plan and the reality of the matter is that China has seemed ready to move away from the U.S. dollar for quite some time. [Not that long ago] China’s official Xinhua news agency called for a “de-Americanised” world and a “new international reserve currency… to replace the dominant U.S. dollar”…Given that Vladimir Putin visited Beijing on May 20, it can be speculated that the gas and oil contracts…signed between Russia and China [at that time] were denominated in rubles and yuan, not dollars. Why is the petrodollar so important? it creates a tremendous amount of demand for the U.S. dollar all over the globe. Since everyone has needed it to trade with one another, that has created an endless global appetite for the currency. That has kept the value of the dollar artificially high, and it has enabled us to import trillions of dollars of super cheap products from other countries. If other nations stopped using the dollar to trade with one another, the value of the dollar would plummet dramatically and we would have to pay much, much more for the trinkets that we buy at the dollar store and Wal-Mart. In addition, since the U.S. dollar is essentially the de facto global currency, this has also increased demand for our debt. Major exporting nations such as China and Saudi Arabia end up with giant piles of our dollars. Instead of just letting them sit there and do nothing, those nations often reinvest their dollars into securities that can rapidly be changed back into dollars if needed. One of the most popular ways to do this has been to invest those dollars in U.S. Treasuries. This has driven down interest rates on U.S. debt over the years and has enabled the U.S. government to borrow trillions upon trillions of dollars for next to nothing but if the rest of the world starts moving away from the U.S. dollar, all of this could change. 1. Would Major Sanctions Against Russia Hasten End of USD As World’s Reserve Currency? 4. Shift From U.S. Dollar As World Reserve Currency Underway – What Will This Mean for America? 6. The Beginning of the END for the U.S. “Petrodollar”! 7. Financial Warfare: What Would Russia’s Sale of US Treasury Holdings Mean for U.S.? 8. Will We See Financial Warfare Between U.S. & Russia? 9. 2014: The Beginning of the END for the U.S. “Petrodollar”! 10. Will the Trickle Out of the U.S. Dollar Now Become a Torrent? Next Could a World of $7,000 Gold, $100 Silver & $400 Oil Be Coming? Another way of looking at countries trading in currency that is not the US$ is that if it continues to happen ever more slowly it will provide a period of time for the value of the US$ to “adjust”, which would be far better than if the world stopped using the US$ in a short amount of time! Either way I look for the value of PM’s and especially Silver to start upward as the value of the US$ tends to decrease!